Ryan Eggold is an American actor best known for his roles in CW teen drama series 90210 and NBC crime drama series The Blacklist. The talented actor also starred in NBC’s short-lived spin-off series The Blacklist: Redemption. The Southern California native was born in Lakewood, California, born August 10, 1984, to James Frederick Eggold and Karen (née Benik). He graduated from Santa Margarita Catholic High School in 2002 and later from the esteemed theatre department of the University of Southern California in 2006. While in High school, Ryan participated in many school theatre performances. Upon graduating from the University, Ryan landed recurring roles on CBS’s Young and the Restless, HBO’s Entourage, Cartoon Network’s Out of Jimmy’s Head, ABC’s Brothers & Sisters and The CW’s Veronica Mars, before obtaining his first series regular gig on the FX’s Dirt. Ryan has also been involved in producing, directing and has also starred in some original screenplays. He created his movie debut – a short film Con: The Corruption of Helm. After stepping behind the camera recently to write, direct, produce, compose and edit his film Literally Right Before Aaron, Eggold says his next career move may involve music. Recently Ryan announced his return to The Blacklist as series regular after leaving the show last year to headline its since-cancelled spin-off Redemption. Ryan isn’t married to date, however, he has been linked with several ladies. There was the rumor about his wedding with co-star Megan Boone and about her pregnancy with him. But it all turned out to be what it was called; RUMORS! as Ryan has never maintained any dating relationship with his on-screen wife off the screen. Well, it must have been Megan’s statement in an interview with capitolfile-magazine.com that fueled the rumor. Now back to the other women in Ryan’s life. Back in 2008, the actor was alleged to be in the relationship with the “Twilight” actress Ashley Greene. Though the couple left people in the dark about their relationship, Ryan on an opening of a Boutique at Malibu on 4th October 2008 had confessed about dating an actress. “I’m dating someone she’s an actress,” he had said. Their relationship obviously failed as Ashley began dating Paul Khoury since the year 2013 and neither Ashley nor Ryan has spoken anything about the failed relationship. In 2009, he was rumored to be dating star from The Haunting of Molley Hartley Hailey Bennet. The relationship between the duo didn’t work out. This was what Ryan had to say when asked about his relationship in an interview with dailytelegraph.com.au in 2014. The Blacklist: Redemption star Ryan Eggold said he has an ex-girlfriend to thank for his recent directorial debut at the Tribeca Film Festival. Ryan told Page Six that an ex-girlfriend once told him she was getting married to someone else — and that Eggold would regret their breakup for the rest of his life. 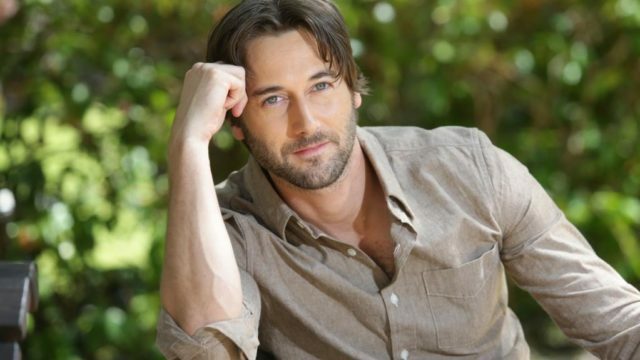 After the break-up, Ryan Eggold has decided to keep his dating life private. So currently, the 33-year-old handsome actor is a bachelor who is busy concentrating on his career. The friendly fun and enigmatic actor has an athletic body, weighs 75kg and is 183cm(6 ft) tall. He has a total of 75.6 thousand followers on Twitter. He has tweeted more than 2,150 times, a clear proof of how engaged he is with his fans. Also catch up with him on Instagram.